Today I have been in Oslo, Norway for client meetings. The topic on the agenda is Central and Eastern Europe and particularly the investment climate in South Eastern Europe. That gives me reason to discuss a favourite topic of mine – “regime uncertainty – as defined by Robert Higgs – and why the present lacklustre recovery in the US economy is unlikely in anyway to be related to such regime uncertainty. As an economist who have been working professionally with Emerging Markets for more than I decade I know about regime uncertainty. In fact I think you to some extent can define an Emerging Markets economy as an economy where regime uncertainty is a dominant factor in the economy. Robert Higgs basically defines regime uncertainty as a lack of protection of property right and a lack of respect for the rule of law. This is a serious problem in many Emerging Markets – including in the South Eastern European countries, which has been the focus of my meetings today. My favourite source for a numerical measure of these uncertainties is the conservative Heritage Foundation’s Economic Freedom Index. We can use the sub-index for “Rule of Law” in the Economic Freedom Index as a proxy for “regime uncertainty”. In my view the Heritage Foundation’s description of the lack of respect for the rule of law and property rights in Albania and Bulgaria is pretty close to the reality in these two countries. So there is no doubt that there in both countries are a considerably degree of regime uncertainty. 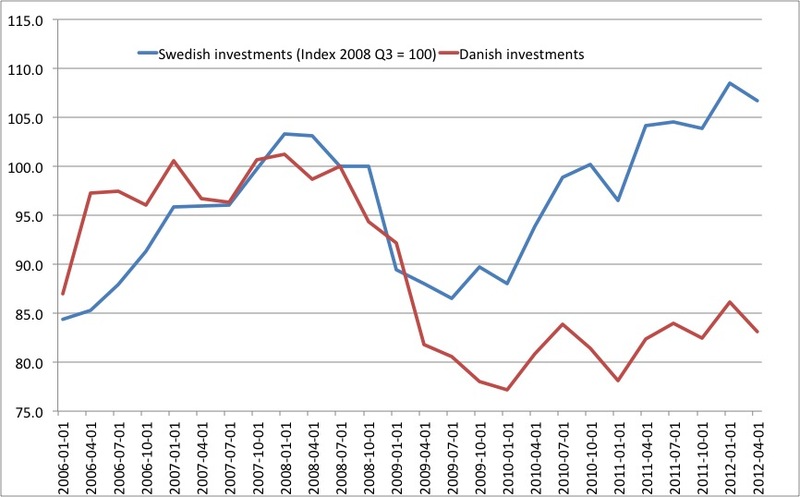 This heightened level of regime uncertainty very likely is having a considerably negative impact on both foreign direct investments and domestic investments in both countries and therefore on the long-term growth prospects of these countries. Who would for example invest in a sea sight hotel in Albania it might be stolen from you tomorrow or in a year – maybe even with the tacit support of government officials? Bulgaria and Albania are just two examples of serious regime uncertainty, but many (most!) developing economies and Emerging Markets around the world have serious problems with regime uncertainty. Therefore, as an Emerging Markets economist I find this issue highly relevant. However, I should also stress that I believe regime uncertainty is a supply side phenomenon. Regime uncertainty hampers investment, which reduces the productive capacity of the economy and hence reduces productivity growth, but as aggregate demand in the economy is determined by monetary factors regime uncertainty – in Higgs’ sense – cannot be a demand phenomenon. Yes, regime uncertainty can impact the composition of demand but not aggregate demand in the economy. The best way to illustrate that regime uncertainty is a supply side phenomenon is to look at three contemporary examples – Venezuela, Argentina and Iran. The regimes in all three countries obviously have very little respect for the rule of law and there is weak protection of property rights in all three countries. 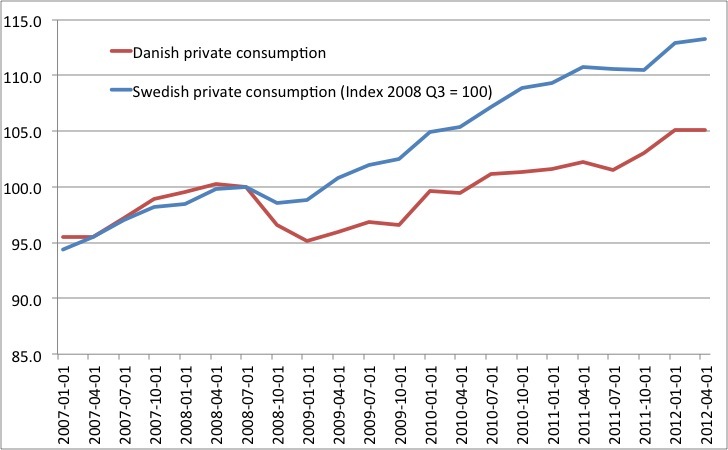 However, all three countries also are struggling with high – and to some extent even escalating – inflation. If regime uncertainty were a demand phenomenon then inflation would be low and falling in these countries. It is not. When I listen to the present political-economic debate in the US many conservative and libertarians economists and commentators (who I would normally tend to agree with) point to regime uncertainty as a key reason for the weak US recovery. 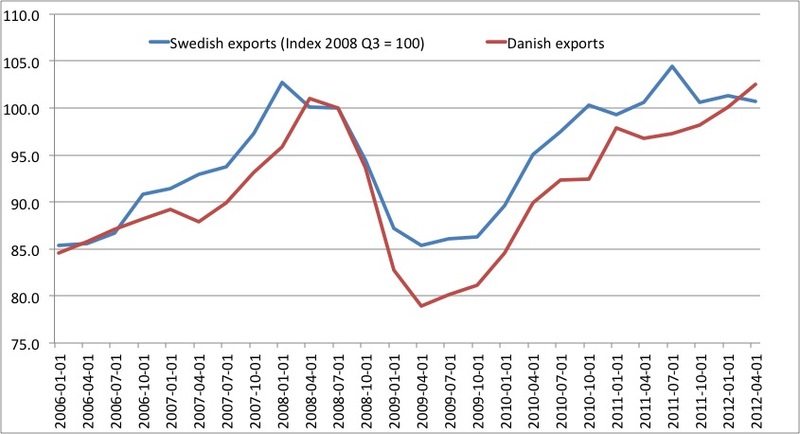 Frankly speaking while I acknowledge that there might have been a rise in regime uncertainty in the US – in frank I am certain there has been – I doubt that it in any meaningful way can be said to have had a notable and sizable negative impact on US investment activity. Furthermore, the US economy is showing all the signs of having a demand side problem rather than a supply side problem. If the US economy had undergone a serious negative supply shock then US inflation would has been increasing – as is the case in for example Iran. US inflation is not increasing – rather since 2008 US PCE core inflation has averaged a little more than 1% a year on average. Even though Heritage Foundation highlights some negative factors the US can hardly be said to be Bulgaria and Albania. In fact the US is in the very top in the world when it comes to protection of property rights and the respect for the rule of law. I therefore doubt that US multinational companies like Apple of Coca Cola are seriously concerned about the rule of law in the US when you take into account that these companies have been seeing there strong sales and income growth in Emerging Markets like China, India, Russia and Brazil. In fact I could understand if these US companies would be concerned about the present regime uncertainty in China in connection with the ongoing leadership change in the Chinese communist party, the crackdown on freedom of speech in Russia under president Putin’s leadership, the scaling back of economic reforms in India or the ad hoc nature of changes to taxation of inward investments into Brazil. So while I certainly remain concerned about the regulatory developments in the US over the past decade (yes it started well before Obama became president) I doubt that the present lacklustre recovery can be blamed on these problems. The reason for the lacklustre recovery is rather monetary uncertainty rather than regime uncertainty. Since 2008 US monetary policy has moved away from a ruled based regime to a highly discretionary and to some extent highly unpredictable regime. That is the problem. So yes, US companies are likely worried about regime uncertainty, but it likely worries about regime uncertainty in China or Brazil rather than regime uncertainty in the US. A simple way to illustrate this is to look at the Heritage Foundation’s score for protection of property rights in some of the countries mentioned in this blog post. Heritage Foundation considers a score between 80 and 100 to be a “free country”. 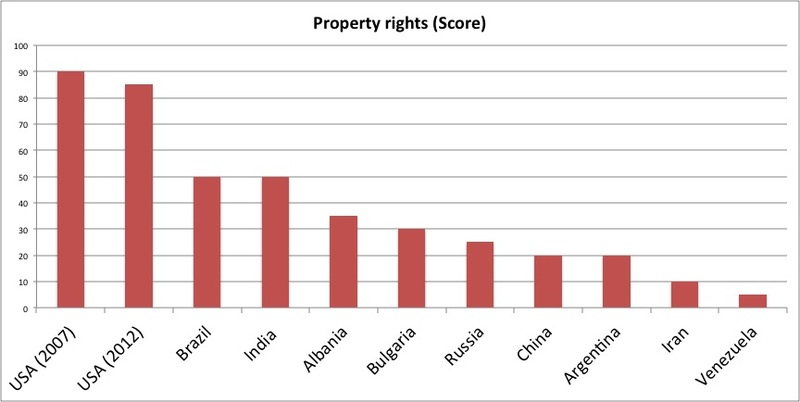 It is very clear from the graph that investors should worry (a lot) about the protection of property rights in Albania, Bulgaria or in the so-called BRIC economies, but I doubt that many international investors have sleepless nights over the whether or not property right will be well-protected in the US. Finally I am as worried about the rise of interventionist economic policies in the US and in Europe as anybody else, but we should be right for the right reasons. Interventionist economic policies surely reduce the growth prospects in the US and Europe, but that is supply side concerns for the longer run and we can’t blame these failed policies for the weak recovery. As Greek Prime Minister George Papandreou is fighting to putting together a new government after he yesterday survived a no-confidence vote in the Greek parliament I am once again reminded by the Argentine crisis of 2001-2002. In my view the similarities with the Argentine crisis are striking – and most of the mistakes made by Argentine policy makers and by the international institutions are being repeated today in regard to the Greek crisis. Most important both in the Argentine case and in the Greek case policy makers refused to acknowledge that monetary policy is at the root of the problems rather than fiscal matters. My favourite account of the Argentine crisis is the excellent book “And the Money Kept Rolling in (And Out)” by Paul Blustein. You can’t help thinking of Greece and the efforts of the last year to “save“ the country when you see the title of Chapter 7: “Doubling a Losing Bet”. I highly recommend Blustein’s book for those who want to understand how international institutions like the IMF works and why they fail and to understand how monetary regimes like Argentina’s currency board become “sacred” – in the same as the gold standard used to be – and this leads to crisis. 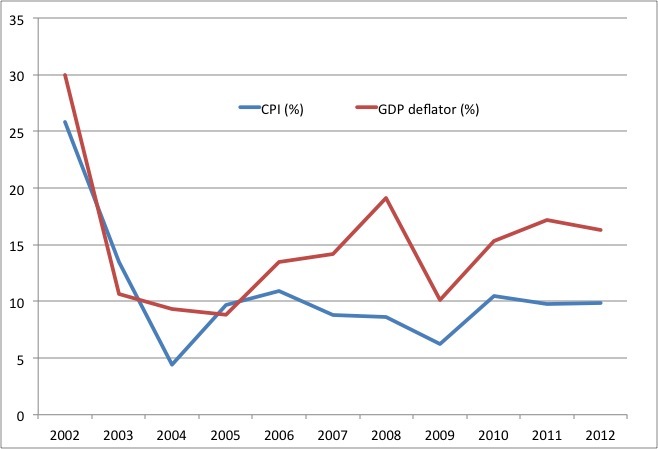 But back to Greece – or rather to the parallels to the Argentine crisis. It has been rumours that former Greek central bank governor Lucas Papademos could take over as new Prime Minister in Greece. I have no clue whether this is going to happen, but the story made me think. When you are in serious trouble you call in a well-respected former central banker to get some credibility. Argentina did that when Domingo Cavallo – the former successful central bank governor – became economics minister. Cavallo became economics minister on March 20 2001. He then tried to push through a number of austerity measures. He resigns on December 20 after massive protest and violence that kills 20 people. So far there has luckily been less killed in Greece. So Cavallo lasted only 8 months – even respected central bankers cannot preform fiscal miracles in insolvent nations. But Cavollo’s 8 months as economics minister might be a benchmark for how long a central banker can stay on as economics minister – or Prime Minister. Another measure of how long Papademos will be able to survive as Prime Minister if he indeed where to succeed Papandreou is to look at how many presidents Argentina had in 2001. First president to step down was Fernando de la Rúa – on December 20 2001 – the same day Cavallo stepped. Next one to step down was Adolfo Rodríguez Saá after 7 days in power on December 30 2001. Eduardo Duhalde came into office January 2 2002 and stays on until May 25 2003. Duhalde a populist famously defaulted on Greece foreign debt – and is more popular with the Argentine public than with foreign creditors. The question is whether Papademos would be Cavallo, Saá or Duhalde. He can’t really be Cavallo – as we are too long into the process and as Greece has already defaulted on some of the debt, but on the other hand the EU has not pulled the plug on Greece yet. It was really the IMF’s stop for funding of Argentina on December 5 2001 that “killed” Saá. Saá, however, while in government defaulted on foreign private debt on December 7 2001 (Greece effective defaulted on a large share of the private sector debt last week). PS I met Cavallo at a seminar back in 2008 – I was somewhat shocked to hear that he still thinks it was wrong that Argentina gave up the currency board despite more than 20 people died in civil unrest while he was economics minister. 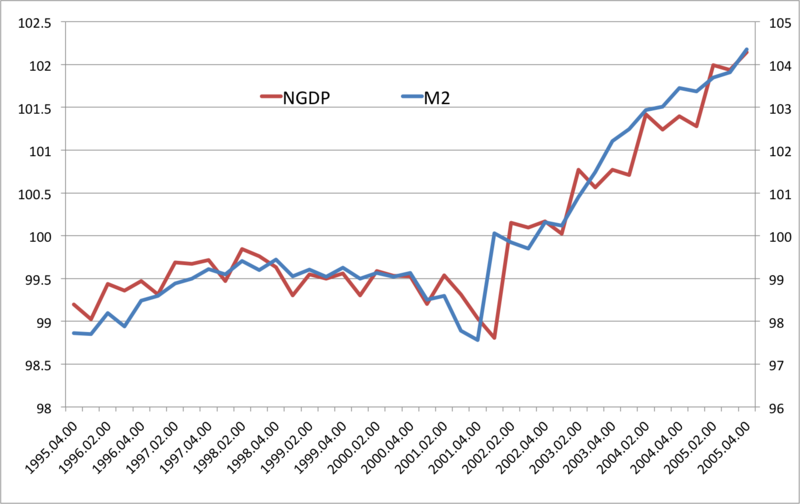 The Argentine economy rebound strongly after the currency board was given up and has growly strongly since then.I am certainly not claiming everything is fine in Argentina, but things are certainly better than in 2001. Update 2 (November 13): Scott Sumner is out with an excellent comment on the lessons from Argentina.